25 Marlborough is located on the north side of Marlborough, between Arlington and Berkeley, with 23 Marlborough to the east and 27 Marlborough to the west. 25 Marlborough was built ca. 1866 for Charles William Freeland, for speculative sale, one of four contiguous houses (21-23-25-27 Marlborough). The four houses form two pairs of mirror opposite buildings (21-23 Marlborough and 25-27 Marlborough); each pair has a single entrance porch which creates a symmetrical entryway. Click here for an index to the deeds for 25 Marlborough. On November 4, 1867, 25 Marlborough was purchased from Charles Freeland by Louisa (Fowler) Hubbell Bartlett, the wife of Homer Bartlett. They previously had lived at 17 Pemberton Square. Living next door, at 27 Marlborough were Homer Bartlett’s son-in-law and daughter (by his first marriage), Frederic Lord Richardson and Mary (Bartlett) Richardson. Homer Bartlett was treasurer of the Massachusetts Cotton Mills in Lowell and president of the Hill Manufacturing Company, operators of a textile mill in Lewiston, Maine. Frederic Richardson was treasurer of the Hill Manufacturing Company. Louisa Bartlett died in May of 1873. After her death, Homer Bartlett moved next door and lived with the Richardsons until his death in March of 1874. On October 6, 1873, 25 Marlborough was purchased from Louisa Bartlett’s heirs by John Foster. He and his wife, Harriet (Sanford) Foster, made it their home. They previously had lived at 94 Boylston. They also maintained a home in Newport. John Foster was a real estate investor and retired wholesale merchant dealing in groceries and general merchandise. Harriet Foster died in February of 1885, and John Foster continued to live at 25 Marlborough until his death in April of 1897. In his will, among many other bequests, he left funds to the City of Boston for the statue of William Ellery Channing which subsequently was erected in the Public Garden. 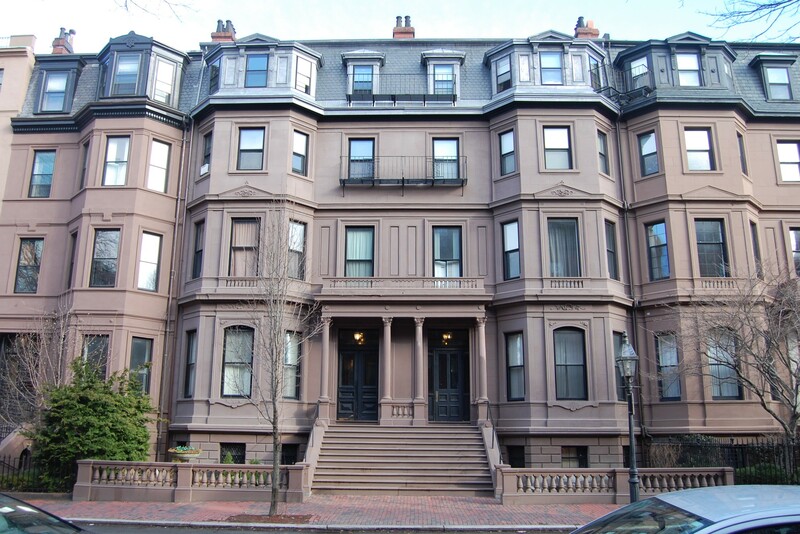 After his death, his unmarried daughter, Fanny Foster, continued to live at 25 Marlborough (and in Newport) until about 1903, when she moved to 26 Fenway. On October 31, 1903, 25 Marlborough was purchased from John Foster’s estate by Leontine (Deletang) Ebann, the wife of Dr. Charles Robespiere Deletang Ebann. He was a physician and also maintained his medical office there. They previously had lived (and he had maintained his office) on Guild Street. Leontine Ebann died in January of 1917. Charles Ebann and their daughter, Caroline Marie Ebann, continued to live at 25 Marlborough during the 1918-1919 winter season, but moved thereafter to 360 Massachusetts Avenue. On March 12, 1919, 25 Marlborough was acquired from Charles Ebann and Caroline Ebann by Susan Sherry. 25 Marlborough was not listed in the 1920 Blue Book. On April 24, 1920, 25 Marlborough was acquired from Susan Sherry by Miss Hannah Parker Kimball. She also maintained a home in West Newton. Hannah Parker Kimball was a poet and active supporter of the Women’s Trade Union League and various other progressive causes in Boston. Her sister, Mary Morton (Kimball) Kehew, the wife of William Browne Kehew, was the first president of the Women’s Trade Union League, formed in 1903. Hannah Kimball had lived with the Kehews at 317 Beacon and then at 29 Chestnut. Hannah Kimball also headed the Psychic Research Library, which she located at 25 Marlborough after she acquired it. On June 21, 1920, she filed for (and subsequently received) permission to remodel the house and convert it into a three-family dwelling. Hannah Kimball died in August of 1921. 29 Marlborough was inherited by her brother and sister, Marcus Morton Kimball and Susan Day (Kimball) Clark, the widow of Robert F. Clark. On May 15, 1923, 25 Marlborough was purchased from Marcus Kimball and Susan Day Clark by Mrs. Mary (May) Adeline (Bradbury) Estes, the former wife of Prince Joseph Estes. She previously had lived at 281 Dartmouth, where she operated a lodging house. In June of 1923, she applied for (and subsequently received) permission to remodel the interior. The house remained a three-family dwelling. Among the longer term lodgers with Mrs. Estes were Richard Rogers Peabody and his wife, Ethel Jane (born Ethel May) (McKean) Peabody. They lived there from about 1927 until about 1933, when they moved to New York City. He was a therapist specializing in the treatment of alcoholism. An alcoholic himself, in 1931 he wrote The Common Sense of Drinking, said to have been a major influence on Alcoholics Anonymous founder Bill Wilson. Mary Estes continued to live at 25 Marlborough until her death in 1935. 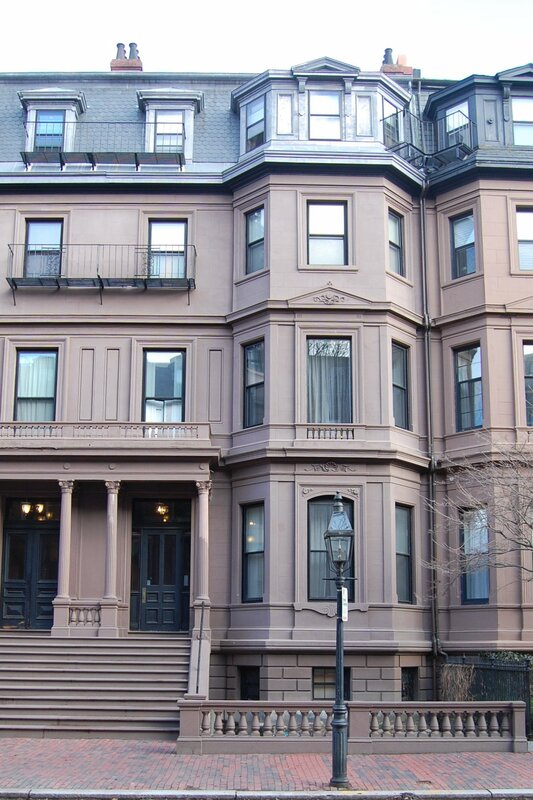 25 Marlborough was inherited by her daughter, Hortense (Estes) Sullivan, the wife of John B. Sullivan, Jr. They lived in Brookline. The property continued to be a multiple dwelling. The legal occupancy remained three apartments but, based on the number of residents listed in the City Directories and Lists of Residents in the 1930s, the number of units appears to have been greater. On March 28, 1946, 25 Marlborough was acquired from Hortense Sullivan by the M. &. R. Realty Corp. The property changed hands and on September 19, 1950, was acquired by Ellen T. (Hughes) Shuryla, wife of real estate dealer Anthony Shuryla (Czuryla). On May 28, 1951, 25 Marlborough was acquired from Ellen Shuryla by the Primus Realty Company, one of several real estate firms owned by Julius Kalman (Kalmanovitz). In May of 1951, the Primus Realty Company filed for (and subsequently received) permission to convert the property from a three-family dwelling into nine apartments. In July of 1951, the Brimmer Realty Company (also owned by Julius Kalman) filed to amend the application to increase the number of apartments to ten. On March 28, 1957, Primus Realty Company transferred 25 Marlborough to Jennie Loitman Barron, Mark R. Werman, and Jacob Grossman, executors under the will of Julius Kalman. On October 2, 1958, 25 Marlborough was acquired from the estate of Julius Kalman by Walter H. Fehrmann and his wife, Virginia (Riselli) Fehrmann. They lived in Watertown and later in Belmont. 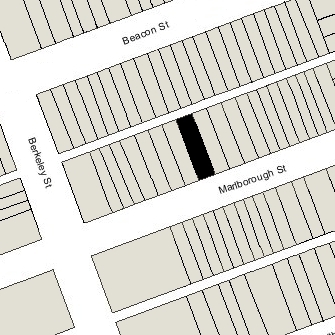 On February of 1966, the Fehrmanns purchased 27 Marlborough, next door.